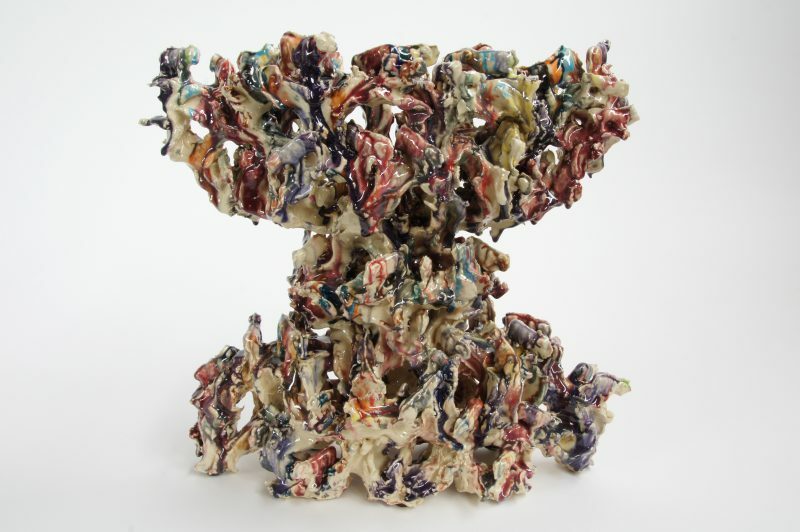 Since the 1980s, sculptor Guido Geelen has consistently given new impetus to Dutch ceramics. Estate founders Jo and Marlies Eijck bought Geelen’s first chalice piece in 1988. This work in red baked clay formed the starting point for a series of now twenty chalices, presented together for the first time in this exhibition. The chalices are always made using the same mould. Manually inserting and kneading the clay strands means each sculpture differs only slightly from the other, yet they are distinguishable through the treatment of the glazes. The contemporary work of Guido Geelen manifests an artistic research of opposites, such as artisan and industrial, nature and culture, chaos and order, figuration and abstraction, and excess and restraint. In this series of works, Guido Geelen examines how different glazes transform the sculpture. Systematically investigating possibilities, Geelen experiments with red, yellow, and blue glaze pigments or the mixed colours orange, green, and purple. 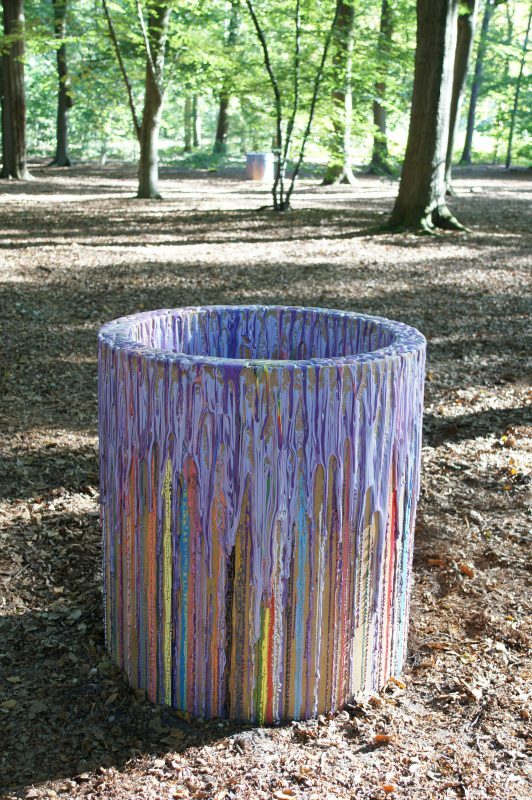 This colouring research continues in the monumental installation presented outside in the estate's forest. Parallel to Colouring – Guido Geelen at Kasteel Wijlre estate, the presentation Flowering – Guido Geelen takes place at the Heerenhof in Maastricht from 27 August onwards. De Heerenhof and Kasteel Wijlre estate share their vision on how living, working and living are intertwined and how nature and architecture fuse. De Heerenhof is a remarkable garden of 3000 m2 with a glass house designed by architect Wiel Arets; the same architected who made the design of the Hedge House at Kasteel Wijlre estate. On the occasion of this presentation, the inhabitants open not only their garden but also their house to the public. Flowering – Guido Geelen at De Heerenhof, Veldstraat 8, Maastricht. From 27 August onwards. For more information about opening hours and entrance fees of de Heerenhof, please visit www.heerenhof.nl.